The Rutherford Family Home, circa 1922. Photo from the Rutherford Collection at PSU Library. Portland State University Library Special Collections holds the Verdell A. Burdine and Otto G. Rutherford Family Collection, donated by their daughter Charlotte Rutherford to PSU in 2012. “It was home to three generations of the Rutherford family, each of which was active in civil rights in Portland. William Rutherford and his brother Henry moved to Portland from Columbia, South Carolina in 1897 to work as barbers in the prestigious Portland Hotel. 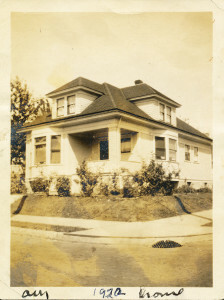 In 1923 William moved into the 1905 house on Shaver Street in the King neighborhood of Albina. Here William and his wife Lottie raised their four children, including their third son Otto, instilling in them a love of community and respect for education and hard work. Otto and Verdell moved back into the family home upon their marriage in 1936 and began their life of activism. A high point in their careers occurred in 1953, when Oregon’s Public Accommodations Act, under the sponsorship of then Representative Mark O. Hatfield, was passed. This landmark legislation occurred when Otto Rutherford was president of the Portland Branch of the National Association for the Advancement of Colored People (NAACP) and Verdell was secretary, positions they held for several years. 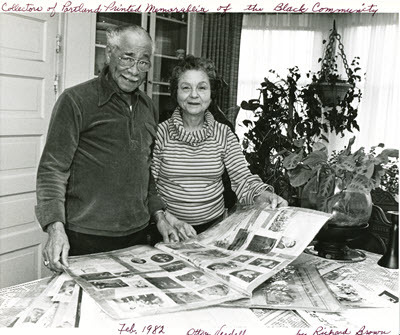 Otto & Verdell Rutherford at their home in 1982. Photo by Richard Brown from the Rutherford Collection at PSU Library. The Rutherford house, where Otto and Verdell raised their three children, was the location of much organizing for civil rights in the 1940s and 1950s, as well as being the first home of the NAACP Credit Union. Learn more about the National Register and recent Oregon place listings. View the online exhibit Say We Are Here: Selections from the Verdell A. Burdine and Otto G. Rutherford Family Collection. Learn more about the Rutherfords and see a larger selection of their family photos, scrapbooks, newspapers clippings, records, and more. See the finding aid for the Verdell Burdine and Otto G. Rutherford Family Collection, 1900s-1980s.